*If you don't have paper bags see ‘How to prepare to make a beard’ instructions (see Printables). Use a pencil and ruler to draw 'cutting lines' onto each bag, following steps one and two of the instructions. 1. 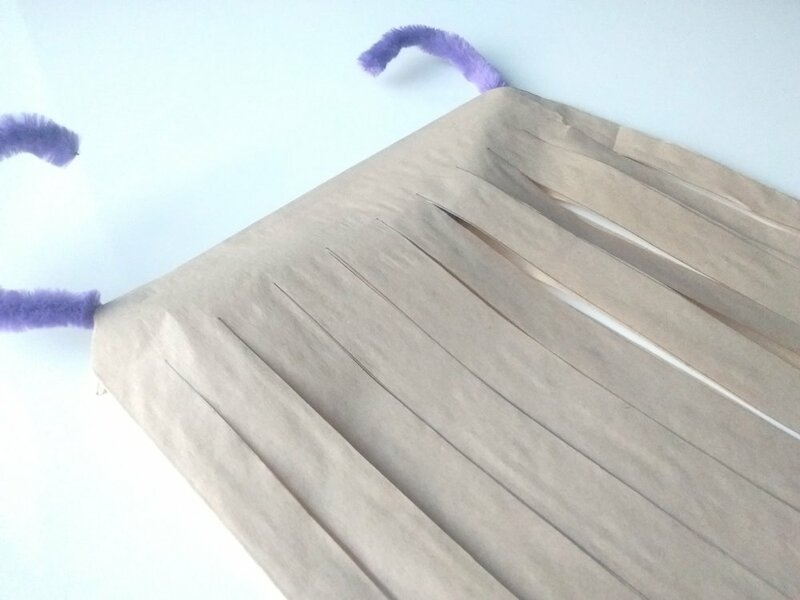 Use a pencil and ruler to draw cutting lines on the paper bags. Draw diagonal lines across the corners of the bag. Make sure there is a gap between the bottom of the bag and the lines. 2. Copy the position of the lines in the picture. Draw the lines approximately 2 cm apart. 3. Cut along the diagonal lines, snipping off the corners of the bag. Push the pipe cleaner through the corner slits until the two ends of the pipe cleaner are sticking out of the bag. 4. Carefully cut along the lines. Make sure you do not cut the bottom of the bag. 5. An adult will need to do this part: open a pair of scissors and slowly slide the blade over the strips, pressing the blade firmly onto the paper. This should make the paper curl. The children can position the beards on their chins by hooking the ends of the pipe cleaners over their ears. Allow the children to admire their beards in the mirror.